South Africa 5-150 (Faf du plessis 58, Hashim Amla 48. Saeed Ajmal 3-25) beat Pakistan 9-144 (Sohaib Maqsood 37, Ahmed Shehzad 21, Wayne Parnell 3-25, Dale Steyn 2-20) by six runs. The Proteas smashed 150 runs after losing five wickets in 20 overs and the Green Shirts reached 144 with one wicket left. Faf du Plessis (South Africa) was announced ‘Player of the match’ and ‘Player of the series’ for his excellent batting and captaincy. The second and final Twenty20 was played on Friday, November 15, 2013, at Dubai International Cricket Stadium. Earlier, Faf du Plessis won the toss for the visitors and Quinton de Kock along with Hashim Amla took off smartly by scoring 37 runs in 4.4 overs. The first was gone for 30 and was replaced by du Plessis who maintained the run rate with his partner. They enhanced the score to 115 when Hashim Amla became the next victim for 48. Faf du Plessis reached his fourth T20 fifty in the 18th over and remained unbeaten for 58 off 48 with 3 huge sixes and 1 fours as the tourists thrashed 5-150. 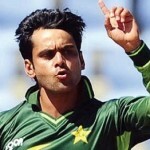 Saeeed Ajmal was the top wicket taker with three wickets and Sohail Tanvir got two. Nasir Jamshed and Ahmed Shehzad gave a rising start to the Green Shirts by scoring 39 in 5.1 overs. 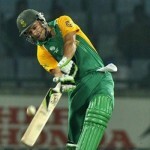 Wayne Parnell struck twice in the sixth over while removing the latter and Mohammad Hafeez for 21 and 0 runs. Nasir Jamshed left the scene seven runs later for 19 when Shoaib Malik and Sohaib Maqsood got together. The first got retired hurt and Umar Akmal scored 11 runs whereas the latter was doing well at his end. The hosts were cruising along well when three deliveries changed the complexion of the game. Shoaib Malik, Abdur Razzaq and Sohaib Maqsood were dismissed for 15, 0 and 37 runs. Pakistan managed 144 runs for the loss of nine wickets after the last ball of the 20th over was bowled. Wayne Parnell was the supreme bowler with three wickets, Dale Steyn and Imran Tahir held two each whereas Ryan McLaren and Henry Davids shared one wicket each. South Africa triumphed in the encounter by a close margin of six runs and grabbed the series 2-0.